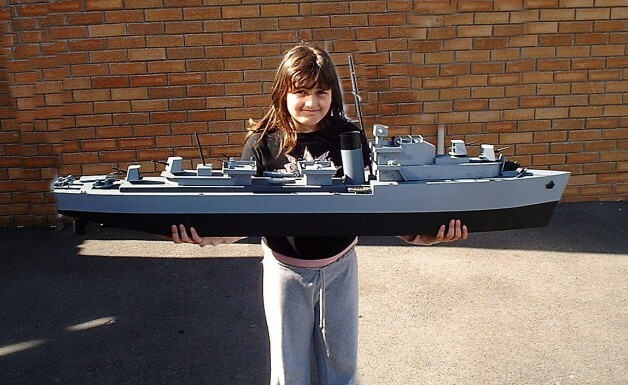 My name is Hannah Windless I am 9 years old and I thought you might like to see HMS Scorpion, my first attempt at model boat building. I used Hal Harrison's HMS Romper as a starting point and doubled all the measurements to make the model 55" long. The hull is flat bottomed and is built from 6 mm and 1.6 mm ply and is powered by 2 545 motors driving twin props on 6 volts. The superstructure is made from thin ply and balsa and follows the plan with a few minor differences to make hull access easier. HMS Scorpion has a few working features, the torpedo tubes on the stern rotate 180 degrees using a servo driving a gearbox. The 4 gun turrets rotate 180 degrees using 2 modified Futuba 148 servos. A home made smoke generator for the funnel. A child's toy cap gun to simulate the gun fire. I use a F14 radio set with 6 channels to operate the model. The model has taken 6 weeks to build and is not finished yet and I did have some help from my dad and I am looking forward to sailing her.